Are you right now where you thought ten years ago you would be today? Are you living where you thought you’d be living, loving who you thought you’d be loving, serving where you thought you’d be serving, working where you thought you’d be working, or has life taken a different direction than you planned? Are you living plan A, plan B, plan C, or no plan at all? This is the route from my house to my son’s house. As you can see, there are three routes. 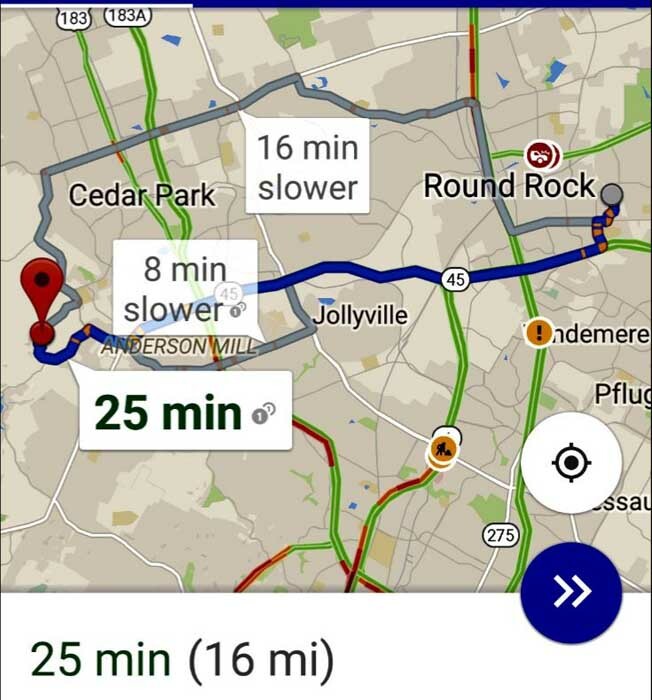 Why would I take any route other than the blue one? I wouldn’t. It makes no sense to go gray. But why is it that when God shows up, he often takes us the long way around? Wouldn’t it be great if God would give us a map like this — maybe showing us a couple of alternate routes, but always taking us to our desired destination. We could live with that. At least we would know that eventually we’d end up where we thought we wanted to be. It’s not that we don’t want God in our plans, we do! But that’s just it, we want God in our plans. We don’t necessarily want to yield our plans over to him for his editing and redirection. And sometimes it is really hard for us to fit ourselves into God’s plan. God’s plan always seems a little harder, a little longer, and from our perspective, it doesn’t appear to be the most direct route. We don’t want to fiddle around on what we perceive as detours and side streets and we think that God doesn’t quite understand our hurry. But then, God has all the time in the world, God lives in eternity. And our timetables are just that, ours. We know that we will find joy when we want for ourselves what God wants for us. But we also want happiness, and too often we convince ourselves that happiness will be ours only when God wants for us what we want for us. However, when the life that God has in mind for us runs contrary to the life that we think we should be living, well, that’s when we find ourselves feeling frustrated, angry, depressed, or even bitter. It’s just so hard to let go, delay, or set aside our dreams and plans. Oh, but how frustrating is that? That’s like picking the longer route to start with. Perhaps, but it might also lead to an entirely different destination. One we never thought of, by way of places we never considered. But it’s just so difficult to embrace a new plan. Imagine though, what wonderful life experiences we might have along the way… Shipwreck, imprisonment, persecution, or joy. We might find ourselves being a conduit of the Gospel. We might have more opportunities to lead others to the Lord. We might discover the path to spiritual growth and maturity. And we just might see God at work like we could never have imagined. Maybe your life is not what you planned. Maybe you’ve had to abandon your route, or your entire map! Maybe the road is so full of twists and turns that you get nauseated thinking about the future. Or maybe your life is better than you ever imagined. Perhaps you have arrived in Blessing Town and there’s no reason to leave. No one knows what lies around the bend, and why would you risk finding out? Your current situation may not be what you planned, but it is where God has allowed, or led you to go. This is the road you are on. But this is not your final destination. Your ultimate destiny is holiness, and every alternate route that God has planned for you will be the most direct route to get you there, (Romans 8:28-30). Paul arrived in Rome by way of imprisonment and shipwreck. Joseph arrived in Egypt as a slave. Jesus defeated death by dying on the cross. God says, “My thoughts are not your thoughts, neither are your ways my ways…as the heavens are higher than the earth, so are my ways higher than your ways. (Isaiah 55:8-9 NIV). We can trust that God’s way is the best way for us. Where are you today? Where do you want to be in ten years? As you map out your strategy to get there, will you be flexible? Will you leave room for God to show up? And when he does, will you take his alternate route with great expectation for what he is going to do in your life! Not always easy to walk God’s plan. But it does work. GEEZ!! The nerve of God. Doesn’t he know I am in a hurry and need to get where I am going and finish my stuff!! So true right?! Next time warn me before you start stomping my toes that way I can a least prepare. Darn it there is that God thing again doing things his way. 🙂 THANKS FOR THIS ONE!! I know…. The nerve! Praise God for showing up!! I immediately thought of Proverbs 16:9: We can make our plans, but the Lord determines our steps. Thankfully he is a God with a good plan!